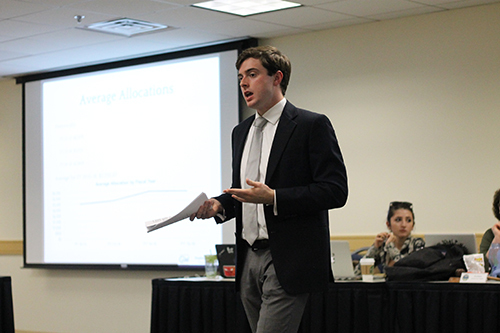 Ben Pryde, the chair of the Student Association finance committee, explained the process of allocating money to student organizations at Monday’s SA Senate meeting. Student Association President Nick Gumas said at Monday’s SA Senate meeting that he will veto the proposed budget to fund student organizations for the next academic year. “Many students are unhappy with the financial allocation process. After reviewing this budget, I believe many students will still be unhappy,” Gumas said. Gumas also said he was disappointed in members of the finance committee who made jokes about the allocation process and organizations who “failed to meet their standards” on social media. “This is not only unprofessional, it also undercuts our ability to be a credible advocacy organization,” he said. Senators debated the allocations for a total of almost 45 minutes throughout the meeting. Amber Singh, a member of SASA, fielded questions from senators after she gave a speech saying that her group did not receive enough money to cover the cost of bringing in speakers or supplying food during day-long conferences. “This funding is going to prevent us from holding necessary programming to provide survivors with support,” Singh said. Singh is a former Hatchet reporter. Sen. Carlo Wood, SoB-U, said he thought the budget showed “underlying discrimination” because he said multicultural student organizations like the Black Student Union and the Organization of Latino American Students did not receive enough funding in the proposed allocations. “Institutionally the way it works, I can’t support that,” he said. Ben Pryde, the chair of the finance committee, gave a presentation to the senate before they voted on the allocations, outlining the criteria the committee used to determine how much money each group received. After Gumas delivered his speech, Pryde said he was irritated that student organizations and senators did not bring up their concerns about the process earlier, and added that going through allocations for three years has made him aware of the flaws in the system. Sen. Casey Syron, CCAS-U, and the SA’s incoming executive vice president, said at the end of the meeting that new SA senators will soon learn when they will have an emergency session to discuss a new budget. The terms for current senators will end on Wednesday morning. The senate also passed a resolution that asks the University to extend the hours of Student Health Service on Mondays and Tuesdays, keeping the offices open for an extra hour until 6 p.m.
Sen. Omeed Firouzi, U-At-Large, said he spoke with Senior Associate Dean of Students Mark Levine to determine how to best to accommodate students who wanted to go to the health center but were unable to fit in appointments during the work day. “Mark Levine said if we passed something out of the SA senate, that would be a strong expression of student opinion,” Firouzi said.